In secondary aluminum melting facilities, pretreated scrap is charged into a melting furnace with flux materials that combine with contaminants and float to the surface, trapping impurities and providing a barrier that reduces oxidation of the melted aluminum. These large furnaces are called reverberatory furnaces. They have the capability to melt over 100,000 to approaching 200,000 pounds of aluminum. Most of these large furnaces are gas-fired. 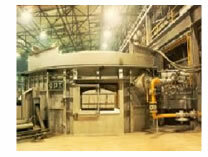 Several basic configurations of reverberatory furnaces are used and a variety of design features are employed that allow the furnaces to tilt (for tapping), have openings to accept hot metal (for reheating if needed) and alloying additions, and often use molten metal pumps (for achieving uniform melt properties). Aluminum scrap or bars as shown in the adjacent picture, are charged through a large door at the front of the furnace. When the molten aluminum is ready, it is gravity drained or siphoned from the melter to a casting operation (either direct or through holding furnaces and Launder systems). A cycle for the batch melting of 100,000 pounds is about 8 to 12 hours to melt the charge and attain about a 1400°F melt temperature. Another 8 hours is usually required for alloying before the melter is tapped. The same box furnace design with the addition of a large exterior charging furnace well. The furnace well is generally about five feet wide located at the charging end of the furnace. With a well-type furnace, dirty and oily scrap and chips and fines are placed or charged outside the furnace (in the well) where oil and other materials can be "burned" off the scrap without disturbing the metal surface inside the reverberatory furnace. These furnaces can be as large as 20 feet in diameter and feature a roof that either rotates or is lifted off (via a crane) for loading scrap aluminum into the furnace. Generally, the roof is fiber lined to reduce weight and provide easier handling. For these furnaces, scrap is charged into one end of a drum that rotates. When the scrap is melted, the liquid metal either flows out the other end of the drum, or remains in the drum for tapping when ready through a tap hole. For all types of gas-fired reverberatory aluminum melting furnaces, the burner ratings will generally range from 8 to 12 million Btu/hr each (and at least two burners per reverberatory furnace). The burners are usually mounted along a side-wall, with the exception of the rotary drum furnace, and a variety of combustion burner designs are employed. Modern burner systems offer the ability to closely control air / fuel ratios and minimize the traditional 2 - 5% metal losses associated with fuel-fired systems. Losses with modern gas-fired systems 1.5 to 2% range can be achieved. Metal losses are not entirely dependant on the heating energy. Scrap that is oily or contains high levels of contaminants or scrap that is small in cross section (turnings, small shredded materials) has a tendency to vaporize and to increase metal losses regardless of the type of heating system. Electrically heated reverberatory furnaces use electric elements mounted on the roof and sidewalls above the hearth. Radiation from these elements provides the energy to melt the charge. The basic designs, with the exception of the rotary drum design, are essentially the same as gas-fired systems (box, box with charging well, and round top). Emissions are present due to oils and other contaminants on the charge materials and they must be captured by an emissions control system. While some heat losses occur due to this discharge, these losses are significantly less than the energy loss in flue gas exhaust of gas-fired designs. However, the chief disadvantage of electric systems is higher operating cost due to the basic difference in energy costs. Electric systems can claim lower metal losses (in the range of 1-2%) compared to gas-fired reverberatory furnaces with older combustion systems and controls. 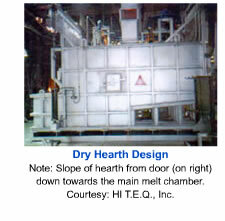 In the Dry Hearth design, medium to heavy aluminum scrap or material to be melted is placed on a dry sloping hearth (note the slope in the adjacent picture). This two-zone design is said to provide safety in charging scrap that may have moisture present. Scrap is melted on the sloping fore-hearth section and the molten aluminum flows down into the main furnace chamber. The benefit of this design is also that melting can easily be stopped and started (by adding or not adding more scrap in the dry hearth section).